A Bernie Sanders White House would be $8 trillion in the hole over a decade. The socialist U.S. presidential hopeful wants to shake up the U.S. economy with dramatically more spending. His promises from free college tuition to a government health system, which he is likely to outline during Tuesday’s Democratic presidential debate, would cost far more than additional taxes would bring in. The Vermont senator’s most expensive idea is to convert the American healthcare market to a national system with the government as the single payer. Sanders would essentially extend the current Medicare program, which is for retired people, to everyone. Breakingviews calculates that this would cost some $9.6 trillion more than current projections over the usual 10-year budget period, based on 2010 healthcare spending and other assumptions including a 25 percent discount thanks to Medicare-style negotiating power and price controls. Sanders wants another $1 trillion to spend on infrastructure. U.S. roads, bridges, trains and the like need investment, but it’s still a hefty sum. And Breakingviews estimates that his call for free public college for everyone who wants it will cost almost as much again, while universal daycare will weigh in at around $500 billion. Along with four other proposals, this yields $12 trillion in new spending. That’s about 25 percent more than currently projected over 10 years. The candidate running under the slogan “Feel the Bern” isn’t shy about boosting government revenue, too. He would institute a Wall Street trading tax, aiming to raise $1.5 trillion over 10 years. His corporate tax plan would eliminate most loopholes and deductions but leave today’s 35 percent rate intact and applicable to global profit, which Breakingviews calculates would bring in another $1 trillion. Lifting the income ceiling for Social Security payroll tax would bring in a similar amount. All-in, Sanders would lift revenue by about $4 trillion over a decade. It may be he has other tax increases in mind beyond what he has already mentioned, or thinks some of the spending will boost GDP growth and hence revenue. But $8 trillion isn’t the kind of money easily found between couch cushions, even in the lofty expanse of the U.S. economy. 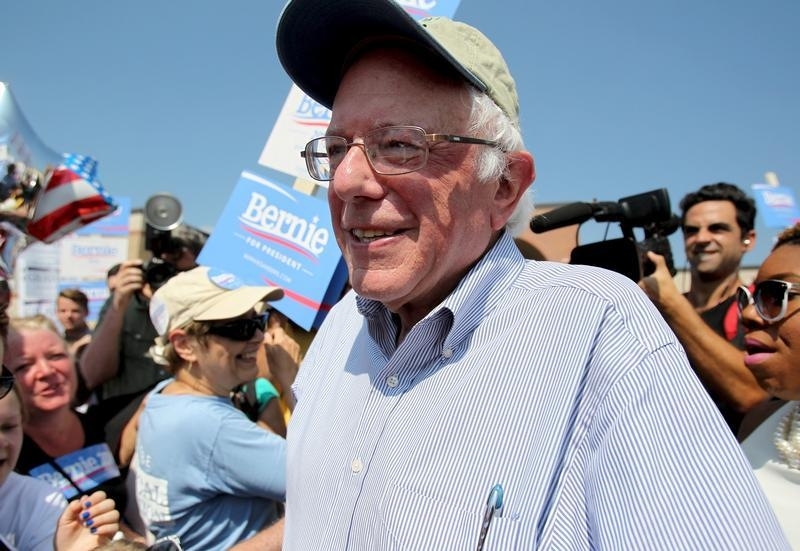 If Sanders wants to realize his socialist dream, he’ll need much higher taxes to achieve it. Coming clean on that might reverse the trend that has narrowed his polling gap with front-runner Hillary Clinton. The first televised debate for Democratic presidential candidates will be held on Oct. 13 at 8:30 p.m. Eastern Standard Time. Polling for the Democratic presidential nomination as of Oct. 8 shows former Secretary of State Hillary Clinton in front, at 42 percent, and Vermont Senator Bernie Sanders ranked second at 25.4 percent, according to averaged results compiled by RealClearPolitics.